ROSAMOND — A 25-year-old Rosamond man is wanted in connection with the theft of three vans from the Southern Kern Unified School District, authorities announced. Efrain Anaya is described as Hispanic, about 6 feet tall, with brown eyes and brown hair. View the wanted bulletin here. He has been linked to a burglary that occurred between Feb. 10 and Feb. 12 at the bus barn of the Southern Kern Unified School District in Rosamond. Three Ford vans were stolen, but two of the vans were recovered on Feb. 12, according to a news release from the Kern County Sheriff’s Office. On Feb. 13, a school district employee spotted the third van, followed it, and alerted authorities. The van was eventually recovered, and the suspects were identified but not located. On Feb. 16, deputies arrested 24-year-old Antonio Gutierrez of Rosamond in connection with the crime. An arrest warrant was obtained for Anaya, but he remains at large. 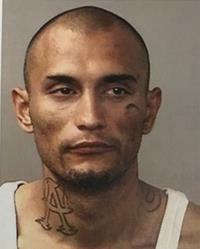 Anyone with information on the location of Efrain Anaya is encouraged to contact the Kern County Sheriff’s Office at 661-861-3110. 21 comments for "Public’s help sought in locating suspected van thief"
[removed] all you I hope you don’t kiss ur kids with those lips.cuz you [removed].Still free and in streets. [removed].EFRAIN LA COUNTY. A. V .Come to Rosamond talking that [removed]. Watch you turn snitch like a [removed].thanks for caring.hating is carrying lame [removed]. Captain Save a Hoe Tim Scott to the rescue lol Man you are always willing to defend the people who choose the life of vagrants. I think you should be the Mayor or the Gov. you would fix everything. Your such a joke Tim Scott. What are you babbling about here? How do you get that I was “defending” anyone? Or are you just so eager to bash me that it doesn’t really matter what I said? As for your request that I leave, I pretty much guarantee I was here before you, so get stuffed. Hi Mark. Always nice to hear from a fan, but the caps lock may be excessive. How about you contribute something and earn some attention rather than just blasting out? The dope will be apprehended soon. Another born loser, ready for pablum at a local prison paid for by the taxpayers. Take that LA off your neck, you are a Rosamonite. You seemed like you live up to your name “fool.” Since we are judging people behind a screen, keyboard warrior, let’s assume you do not have a proper education. Your grammar needs a little help. We should seek the public help for an English teacher in order to teach you basic punctuation. Maybe a book “English for dummies” if you can afford it? You are not any better. The article says connected….not guilty. You wanna label, and I label you fool. Oh @Human, I already tried to assist these racist swine losers, but their narrow minded speck for a brain will not take proper English directives. Let them drown in the vile and poison of their own hate, educators will not waste a minute on racist Caucasian drop-out idiots…at least I won’t. How pathetic must they feel when Mexican-American educators are teaching their own children how to forge a thought on paper or online w/ better communication etiquette and understanding than they could aspire to. We are here, we are American and we plan to defend ourselves from your passive-aggressive methods. ¿Comprenden? This guy is 25? Are you sure you got the age correct? Man drugs and the streets must have aged him. For the record they didn’t even ask me Why my phone was in Van I lost it going to ur mothers house. Different laws for different people? Are you serious? Do you really believe that? This blows my mind. Educate yourself people. Your failure to grasp reality is astounding. You so clearly have never even looked into the basics of what you are talking about here that one wonders how you came to be talking about it.